Turner & Harrison was a steel pen (aka dip pen) company, located in Philadelphia, from its founding in 1875 until the company’s dissolution in 1952. It was one of the largest steel pen companies in the United States, and was known for the quality of their steel pens. The company produced several lines of pens including the Russia Moheta and Constitution lines, as well as their self-branded Turner & Harrison Standard pens. In 1900 they purchased the Leon Isaacs Pen Company and added the Leon Isaacs Glucinum Pens as their new flagship line. From that point until at least the 1940’s, the Leon Isaacs Glucinum Pens were highlighted on every advertisement. Turner & Harrison was founded by John Turner and George Harrison in Philadelphia in 1875. Turner and Harrison had a lot in common before they joined to form this new company. Both had run steel pen companies, both were trained as tool makers for the steel pen industry, and both were trained in the birthplace of that industry, Birmingham, England. John Turner was born in England, most likely somewhere around Birmingham, around the year 1823. Not much is known of his early life except that he apprenticed in a one of the large pen factories in Birmingham. A 1901 short article says that he apprenticed at the age of 13 under Gillott. Most apprenticeships in those days in the pen industry lasted 5-7 years. After his apprenticeship he traveled to France to learn how pens were made on the continent. He eventually returned to Birmingham, got married to his wife Eliza, and then in 1860 he sailed to the United States. In one of the only biographical sketches found of John Turner, from Geyer’s Stationery in 1901, a trade publication for the Stationery and Fancy Goods trade, we learn that he came to the US “as one of a small party of skilled pen makers to start the first pen factory in this country.” Excusing the hyperbole of “the first pen factory in this country” (steel pens had been made here since at least 1803), the reference is almost certainly to the Esterbrook Steel Pen Manufacturing Company. Esterbrook was founded around 1858 in Philadelphia by Richard Esterbrook. In 1860 he moved his factory to Camden, NJ and brought in a number of British craftsmen from the Birmingham pen factories to get his company off to a solid start. The earliest evidence for John Turner in the US is found in the ship’s registry from the Persia, out of Liverpool, arriving in New York 15 August, 1860. We next find him in an 1863 directory of Camden, NJ. living on 131 Birch Street and described as “steel pen manufacturer.” Now, at that time, there was only one steel maker in Camden, and that was Esterbrook (page 46 in the same directory). It is highly unlikely that John Turner was working for another steel pen maker in Camden at this time. The evidence, therefor is very strong that Turner was one of those skilled British tool makers brought by Esterbrook. In 1865, Samuel Warrington, a manufacturer of small metallic fittings in Philadelphia, started the Continental Steel Pen Works under the name of Warrington & Co. at 12th & Buttonwood streets in that same city. By 1867 John Turner also shows up in Philadelphia working at 12th & Buttonwood, having joined Warrington Steel Pen Co., most likely overseeing the pen making operations. The factory, on the northwest corner of 12th and Buttonwood, had difficulties from early on. In 1869 there was a major fire in a factory and warehouse across the street on the southwest corner, which was shared by several businesses. According to a long article in Philadelphia’s Evening Telegraph of September 17, there was much destruction to that building including a cooper who lost several thousand finished barrels, and the owner of the building, a Colonel Thomas, had stored 1000 barrels of flour which were consumed, along with a store of muskets for his local regiment. The fire spread northwards across the street to the factory where Warrington occupied the second and third floors. They suffered $3,500 of damage, mainly from water flooding their steel stock and machinery. But it was the second fire, in 1873, which finally spelled the end of Warrington & Co. This one started in their building and on their third floor. According to an article in the Philadelphia Inquirer of December 8th, “a large quantity of penholders, stored in barrels, quickly took fire, and the flames burned fiercely…” This time, the loss was $20,000 of which only $11,000 was insured. This seemed to have been the final blow. In 1875, John Turner joined with George Harrison to buy out the remaining equipment and stock from Samuel Warrington and his partners, to then found Turner & Harrison ‘s, still located at 12th and Buttonwood. George Harrison was also born in Birmingham, and also around 1824. In late 1886 they moved from 500 N. 12th (12th and Buttonwood), to 1211 Spring Garden St. (1887 directory they’re at Spring Garden St., but in April of 1886 there was a notice in the The Times (Philadelphia) where a guy tried to pass a bad check at Turner & Harrison at their offices at 12th and Buttonwood. “John Turner”. Geyer’s Stationer: Devoted to the Interests of the Stationery, Fancy Goods and Notion Trades. 31: 12. April 4, 1901 – via Google Books. “Pen History: The Early Years – 1820’s, Foundations Laid”. The Steel Pen. 2017-11-09. Retrieved 2018-03-20. Based on personal email conversation with researchers at The Pen Museum in Birmingham, England. “Peregrine Williamson: Inventor, Businessman, and Pioneer Pen Maker”. The Steel Pen. 2017-11-02. Retrieved 2018-03-20. A. McElroy & Co; Orrin Rogers (Firm); E.C. & J. Biddle (Firm) (1837). McElroy’s Philadelphia city directory: 1865. Library Philadelphia Museum of Art. Philadelphia : A. McElroy & Co.
A. McElroy & Co; Orrin Rogers (Firm); E.C. & J. Biddle (Firm) (1837). McElroy’s Philadelphia city directory: 1867. Library Philadelphia Museum of Art. Philadelphia : A. McElroy & Co.
“1869 – Warrington & Co. Steel pens, fire destroyed the building they were in, in Philly – Newspapers.com”. Newspapers.com. Retrieved 2018-03-20. I have three steel pens. One of them is marked 149 Pacific Railroad, one is marked 145 Pacific Railroad but the number is imprinted upside down to most manufacturers, and one is marked 0149 Monarch Railroad, which is also imprinted upside down. None of these are names of actual railroads that I’ve been able to find. We know that there were pens marked as “railroad” which had nothing to do with actual railroads, like the Esterbrook Standard Railroad, which was made by Esterbrook but sold by Sears, Roebuck and Company. All three of the “Railroad” nibs under discussion are extremely similar. They are a wider-bodied straight pen, medium flexibility and with three just slightly different grinds. To confuse matters even more, both Esterbrook as well as Turner & Harrison made a 149 Pacific Railroad pen. Neither, that I’ve been able to find, made a 145 Pacific Railroad pen. After Gillott sued Esterbrook in 1872 pen makers, especially Esterbrook, were careful to not copy the name and especially the number of another pen maker if there was any chance that the two pens could be mistaken for each other. How to explain this, then? One possibility to explain why one didn’t object to the other making a pen with the same name and number is that both Esterbrook and Turner & Harrison were copying a pen from someone else who had already gone out of business and so would not be in a position to sue. This practice is not unknown. We know, for example, that Esterbrook produced a copy of a popular pen from a company that had gone out of business, namely the 505 Harrison and Bradford’s Bookkeeper’s Pen. (picture below is from the 1883 catalog) They made this for a very short time after Harrison and Bradford went out of business in 1881. So, it’s possible that both were producing a popular pen from someone else after that company had gone out of business. I looked for evidence of Pacific Railroad pens as a separate brand. Unfortunately, what evidence I’ve found is not conclusive, and doesn’t make sense based on Esterbrook making the pen in 1883. The State of Nevada advertising for office supplies proposals in 1884. Sometimes these lists contained brands they had purchased in the past, but were no longer available. Was that the case here? An 1895 ad for Pacific Railroad pens but no “Esterbrook” or “Turner & Harrison” designated. 1902 ad for unbranded pens, including the Pacific Railroad pen, listed like it’s a standard pen shape like Falcon and Bank. Of course, that doesn’t explain the 145 Pacific Railroad pen. Nor the 0149 Monarch Railroad. So, if anyone has one of these pens, has a reference to a non-Esterbrook or non-T&H Pacific Railroad (149, 145, or anything else), or anything related, I would love to see it to try and solve this mystery. My steel pen history is now beginning to enter the golden age of US steel pens. We’re now into the 1860’s-1870’s when we see a transition from the first industrial steel pen makers to a wider market and a variety of manufacturers. For this episode, we’re taking as our starting point 1864. In 1864, in Camden, New Jersey, Esterbrook was starting to really take off, and up in New York City, Washington Medallion Pen Company was involved in a protracted legal battle over trademark with two of their ex-employees George Harrison and George Bradford. Harrison and Bradford had just started their own pen company, and were starting to make their own pens using the old Washington Medallion machinery. Also in New York City, Myer Phineas was still making pens at 33 Maiden Lane. Despite this new (and old) crop of pen manufacturers, all indications are that most pens sold in the US were still British pens, mainly Gillott and Perry. We can surmise this both by the requests for bids being submitted by various federal, state and local government agencies to be supplied for stationery, as well as the complaints about how much Americans were spending on “foreign” pens. These requests for quotes were published in newspapers, and they may well indicate the general availability and desirability of American vs. British Pens. Without taking a scientific survey, it’s pretty clear the number of British pens requested almost always outnumber the American pens, often by a lot. Plus, we still have plenty of complaining in the advertisements for American pens about how Americans should “buy American” rather than British or French. 1865 Esterbrook ad from Charleston, SC. Into this environment of new pen companies, we are about to see Philadelphia finally emerge as one of the dominant centers for steel pen production. Esterbrook had operated out of Philly, with at least a warehouse there until 1866, but had quickly moved pen production just across the river to Camden in 1861. It wasn’t until 1865 that Philadelphia was to get its first, industrial-scale steel pen factory, and it was far from the last. Philadelphia in 1864 was an industrial town. Steel, chemicals and dyes, tools, and other products were made in abundance. Skilled mechanics and especially those who could make precision machine tools and complex presses and dies were fairly common, both because of the presence of the various industries, and also because of the presence of the mint in Philadelphia. The role of the coin press in the development of the steel pen manufacturing process is a story yet to be told. One of the other big industries in Philly was umbrella and parasol manufacturing. (approaching Paris in the number produced every year) One of the reasons for this was the presence of a firm called George W. Carr & Co.. The company run by Carr and his partner, and brother-in-law, Samuel Warrington, was the largest manufacturer of whalebone and rattan (used in the ribs of the umbrella) in the US. By 1862, Carr had expanded into making the new steel frames for umbrellas and parasols in addition to continuing to manufacture whalebone and rattan. In 1863 Carr & Co expanded their metallic products by beginning to manufacture small, metallic, mountings, primarily used for umbrellas, in the same location as the whalebone and rattan factory. Samuel was put in charge of the metallic mountings business. Around 1864 this same Samuel Warrington designed a new style of steel pen and he received a patent for it in 1866. The patent is for a pen that has “softness” without being too flexible in the tines. In other words, the pen would flex in the middle without spreading the tines “to such an extent as to produce too heavy a line.” This type of design I call a “spring crimp” because it has a crimp in the middle of the pen to give spring to the body without affecting the spread of the tines. Washington Medallion’s pen was another such design, and most manufacturers produced something similar. In addition to filing for a patent, Warrington wanted to manufacturer his pen, and so in 1865 he founded Warrington & Co. and hired the experienced pen maker John Turner from across the river in Camden, New Jersey to head up this pen-making enterprise. We last saw John Turner over in Camden helping Richard Esterbrook start up his factory there. Turner had been one of the skilled British tool makers Esterbrook had brought to America around 1860 to set up the new factory in the Birmingham style. Warrington was presumably able to lure him over to Philadelphia with the promise of leading the new company and being able to set it up as he saw fit. Rather than being a senior tool maker at Esterbrook, he became the head of the brand new Continental Steel Pen Works of Warrington & Company. The factory was located on the northwest corner of 12th and Buttonwood streets in Philadelphia. Warrington had taken on two other partners for this venture besides John Turner: Joseph Truman, & Edward Smith. It’s not clear who these other two gentlemen were. There is a mention of a Joseph Trueman (with an “e”) in earlier directories, listed as an Engineer, but neither he nor Edward Smith are found in either Camden or Philadelphia before this. As they seem to appear out of nowhere and disappear after the company is dissolved, they remain a mystery. The other partner, John Turner, is better known because of his continued prominence in the pen industry until his death in 1904, as I’ll discuss elsewhere. Before we see where he’s going with Warrington, let’s learn a little about where he came from. John Turner was born in Birmingham, England around 1823. Sometime around 1836, when he was 13 or so, he was apprenticed to one of the brand new pen works appearing almost daily in Birmingham. According to later accounts, after his apprenticeship he went to France to better learn French pen making, before returning to Birmingham where he married his wife Eliza. At some point, probably about 1858 or 59, he is recruited by Richard Esterbrook to come to the US. In 1860, John arrives in New York, and presumably Eliza arrives not long after, along with an adopted daughter, possibly a niece on Eliza’s side, named Rosina. They first live in Camden, with John working at Esterbrook, but in 1865 he takes control of the new Warrington & Co. and by 1867 they had moved to Philadelphia. During the time Turner ran Warrington & Co. from 1865 until 1875 the company found both success as well as set-backs, including two fires and the death of the owner. In 1869, a fire started in a warehouse across the street (southwest corner of the intersection), but it burned so hot that the firemen could only focus on keeping it from spreading. This involved dousing the adjacent buildings in water. The water was good for neither the steel used for the pens nor the precision machines. Fortunately, losses were estimated at only $3500 and their insurance covered $10,000. In the second fire, in 1873, the fire started in the same building and the damage was more extensive. This time their losses were estimated at $20,000 and their insurance was only $11,000. In addition to the fires, in 1872, Samuel Warrington dies. In 1873, after Warrington’s death and the second fire, the company changes its name to The Warrington Steel Pen Company. In that year as well, the company, along with the rest of the nation, was plunged into a depression by the Panic of 1873. Following all of this, “excitement,” in 1875 John Turner purchased the factory, presumably machinery and all, and joined with his new partner, George Harrison (of Washington Medallion and then Harrison and Bradford) to found Turner & Harrison in the very same location at 12th & Buttonwood. Turner & Harrison would go on to become one of the top pen manufacturers in the US and would continue making steel pens in Philadelphia until they closed their doors in 1952, but that’s a story for another time. The Warrington Steel Pen Company name was then picked up by a nephew of Samuel Warrington’s, Theodore Lippencott Warrington, aka Theo L. Warrington. Theo L. Warrington, as he was listed in the advertisements, was born in Camden, NJ and worked for his father, James Franklin “King of the Commission Merchants” Warrington when he was a young man. James owned a produce market buying and selling exotic produce, like peanuts and tropical fruits off the ships coming in to Camden’s ports from places like Cuba and Florida. Theodore began by working for his father, but then tried his hand at teaching for a short time, before joining another Camden native, William H. Ryno, to open their own produce market called Ryno & Warrington from around 1874-75. In 1875 Theo acquired the Warrington Steel Pen Co. name and became partners with William Pedrick, forming Pedrick and Warrington. William Pedrick had his own stationery store before joining with Warrington. Pedrick & Williamson was a modest stationery story located at 1218 Buttonwood, just a half-block from the Warrington & Co’s. factory at the corner of Buttonwood and 12th. By 1874 Pedrick was running the store by himself and lived at the shop in the new location of 107 North 5th Street. In 1875 they joined to form Pedrick and Warrington to both make pens under the Warrington name, as well as sell stationery from their expanded shop and manufactory at 105 and 107 N. 5th Street. By 1881 Pedrick was out of the picture and it was just Theo’s name associated with The Warrington Steel Pen Co.
Theo Warrington made pens up through 1885 when he seems to have gotten out of the pen and stationery business. By 1901 he’s become an electrician in his long-time home of Camden, NJ. Theodore passes away in 1920 at the age of 69 and is buried in Evergreen Cemetery in Camden, NJ. The interesting thing about this nib is that it is pretty much exactly like the Colorado nibs produced by Warrington’s neighbor across the river, the Esterbrook Steel Pen Company. These pens are often advertised as “indestructible” because they don’t corrode in ink, and, supposedly, you can bend them back into shape should you accidentally drop it. Esterbrook even produced a version with the name “Indestructible.” And in this ad from 1868, Warrington promotes their “Indestructible” pens and differentiates them from their steel pens. This tells me that they were most likely producing more than just one style of brass pen. Esterbrook also produced a whole series of these brass pens. Most of them were in the Colorado pen series, from the Colorado No. 1, No. 2, No. 3, No. 304 Colorado No. 2, and several others using the same shape but with different names, like the Indestructible, and the larger version, the Arlington. But the most common was the Colorado No. 2. All of the Colorado pens, whether Esterbrook or Warrington, are made of a brass alloy and are imitative of gold pens in their shape and looks. The name may come from the large gold deposits first discovered in Colorado in 1859 and which continued to pump large amounts of gold eastward for years after. The question is, which came first, the Warrington Colorado, or the Esterbrook Colorado series? Did John Turner lift the design from his time at Esterbrook, or did Esterbrook take the design from Warrington? I have found one reference to Esterbrook making Colorado pens during the same time as Warrington was in business. And we know that Warrington shared the building at 12th and Buttonwood with the Dearborn & Co. Brass foundry. Unfortunately, the earliest actual list of pens made by Esterbrook is from 1876, and we have no list other than the ads of what pens Warrington made, so right now there is no evidence for who made what first. Here’s an 1877 ad that introduces their new “Indestructible” pen. The reference to “curb stone salesmen” means door-to-door salesmen. So, who copied from who? Were both of these copies of someone else? It’s a question we may never be able to answer. Thanks to fellow collector David Berlin, I have a picture of another Warrington & Co’s pen. This one is an oblique using the Mordan design. Anyone else have one? Would love to gather pictures of more examples should any exist. Richard Esterbrook was born in 1780 in Liskeard, Cornwall. In 1809, he married Anna Olver, also from Liskeard and they had their first child, Martha, in 1810, followed by their son Richard Esterbrook in 1813. Richard Esterbrook was a devout member of the Society of Friends (Quakers) until his death in 1846, and is buried in the Society of Friends graveyard in Liskeard. The Quaker Burial Grounds in Liskeard. Courtesy of the Liskeard and District Museum. Richard Esterbrook’s grave. Courtesy of the Liskeard and District Museum. This story is not about him. It is actually about his son, Richard Esterbrook, and his grandson, Richard Esterbrook, and even his great grandson, Richard Esterbrook. Now we have that thoroughly confused, we’ll start the story back in Liskeard, Cornwall where the eldest Richard is still a baker. In the town are places of worship for the methodists and quakers, and some small schools, in which children are instructed gratuitously; also a grammer-school, supported mainly by the members for the borough. The town is supplied with water from an admirable spring; and the neighborhood furnishes examples of what are supposed to be druidical remains. The market-day is Saturday, and there are six fairs held annually, viz. February 18th, March 25th, Holy Thursday, August 15th, Oct. 2nd, and Dec. 9th. The number of inhabitants in the borough and parish of Liskeard, according to the last returus, was 3,519. In 1839 Sr. already has a small family with his young son, Richard Esterbrook Jr. who was born in 1836, just over 8 months after his marriage, and a daughter, Mary Anna, born in 1838. Here is the bookshop and stationery store at 20 Pike St. in Liskeard, Cornwall. On the left (picture courtesy of the Liskeard and District Museum) as it looked in c.1910 after being purchased by W.H. Smith, a national chain of stationers, and on the right as it looked mid-2018 as a travel agency. There’s a small, one-story living quarters above. In the 1851 census of England, we find 14-year-old Richard Jr. attending school in Falmouth, residing with the family of the School Master, Squire Lovell. Richard Sr. is still running his shop in Liskeard. By 1856 Richard Sr. is no longer listed in the directories as a common shop keeper but is listed in the section titled “Gentry and Clergy” and is recorded as living at Dean Terrace. His stationery business is still running, and he’s moved up the social strata, possibly because of his business success, and/or, even more likely, his standing as a senior minister in the Society of Friends. Dean Terrace in Liskeard. Courtesy of the Liskeard and District Museum. We also find in 1856 that 20-year-old Richard Jr. is back in Liskeard and listed as “Manager of Gas Works.” This position did not seem to last long because within the next year or two he was gone and a period of great change for the whole family takes place. The details of this next five years get a bit fuzzy. They are highlighted here and there with markers of clear evidence, and filled in the rest of the way with some stories passed down through histories from the family and from the company, and spiced with a bit of conjecture built out of a combination of the two. I would love it if others could help me fill in some of the gaps with real information. If you have such info, contact me via the Contact link on this site. It will hopefully be clear in the next section when we have good evidence and when we don’t. Sometime between 1856 and 1858 it seems that Richard Jr. left Cornwall and emigrated to Canada. He somehow convinced his father to join him sometime later. There are stories that say Jr. came to the US and tried to make steel pens but failed, or that he came to sell items, of which steel pens from Britain were included, and seeing a practically virgin territory with little native capacity for making good steel pens, he contacted his father to come and take advantage of this great opportunity. Fortunately for us, Quakers had a practice when moving from one congregation of Friends to another, to bring with them, or have sent ahead, a written Certificate of Removal. This let the new group know that this stranger was of good moral standing, a devout member of the Society, and free of debts. Also fortunate for us, the Quakers in Ontario also kept meticulous records of their meetings. Even more fortunate, these records are digitized, searchable, and images are available online at ancestry.com. From these records we can trace Richard Sr., his wife Mary and their daughter Mary Anna from Toronto to Galt, Ontario, and then from Galt to Camden, New Jersey. We also find out that Richard Jr. may have spent some time in the area as he was also under the purview of the Norwich Meeting. We know this because it is to them he directs his resignation from the Society of Friends in 1861. A committee in Norwich was formed to investigate and meet with Junior, and they finally accepted his decision early in 1862. In 1861, Richard Sr., along with his wife and daughter, are granted certificates of removal recommending them to their new congregation in the Friends Meeting of Haddonfield, New Jersey, one of the oldest Quaker communities in the United States. In many histories of the company, 1858 is given as the date for the founding of R. Esterbrook & Co., but it is more likely that this is the date in which Richard Jr. began to try and make pens on his own. Many stories talk about Junior attempting to make pens, and being unsuccessful, convinces his father to come to the US and help him start a new company. I’ve also run across a story that Jr. tried making pens in Canada first, and his father suggested Philadelphia as a better location because of its already extensive steel and manufacturing base. I’m sure the strong Quaker community there was at least an added bonus if not a major factor in choosing that location. The business of Steel-Pen Manufacturing was commenced by them [Sr. and Jr.] in this country [USA] in the year 1860, the United States being almost wholly supplied to that time with Pens of foreign manufacture. This phrase “in this country” seems to support the theory that perhaps Jr. was trying to make pens in Canada in 1858, only moving to the US by 1860. We do know that by 1861 both Sr. and Jr. appear in Philadelphia/Camden directories as living in New Jersey. As an odd side note, we also find almost the whole family, Sr., Jr., and Mary, but without Mary Anna, counted in the 1861 Canadian Census as being in Montreal. The Census lists Richard Esterbrook and Richard Esterbrook Jr. as “Manufacturers,” and their residence is given as Philadelphia. They’re enumerated on a page with another large family whose father is also listed as a “Friend” under his religion. Could they have been staying with a fellow Friend while traveling or visiting and been caught up in the census count? It’s possible. It’s also interesting that they list Philadelphia as their residence. If they ever actually lived in Philadelphia it wasn’t for long because by 1862 they were living across the river from Philly in Camden. And before that they were still in Canada. The last oddity about this record is that Jr. is listed as Married, but he didn’t get married until the next year. It goes to show that you can’t always trust census takers to get it 100% correct. Richard Sr. set up the first Richard Esterbrook & Co. in 1860, as mentioned above, with warehouses and offices at 403 Arch St. in Philadelphia, and the factory and headquarters across the river in Camden, NJ, along Cooper St., in the former water pumping station. His first partners in the pen business were Joel Cadbury Jr., and William Bromsgrove. Joel Cadbury Jr. was the son of a prominent Philadelphia merchant who owned a dry goods store at 252 Franklin. Joel Sr. was also on the board of a local canal company and his brother ran a pharmacy in the same store on Franklin. The Cadburys were also Quakers in good standing and long residents of the city. They were logical partners for Esterbrook because they had connections, access to money, and extensive knowledge of the local business community. William Bromsgrove, on the other hand, was also a foreigner, like the Esterbrooks. He came from Birmingham where we first encounter him as a young man boarding in the house of a tool maker in 1841. By 1845, though, the directory of Birmingham lists him as a “steel pen manufacturer, [at] 13 & 14 Cumberland St.” He’s also listed alongside his presumed partner Alex Cope as actual steel pen manufacturers with Gillott, Hinks & Wells, John and William Mitchell and the other manufacturers both famous and forgotten. The next year, in 1846, he is also listed as a Steel Pen Maker on the baptism record of his daughter Emily. This was a time when pen makers popped up and disappeared regularly in Birmingham. The big names of Gillott and Mitchell and Mason were only starting to be recognized as major players. Bromsgrove and Cope seem to have been one of these small manufacturers who never made it big and they disappeared after just a year or two. What Bromsgrove did between 1846 and his joining Richard Esterbrook in 1860 is not currently known. It’s probably a good guess that he continued working in the steel pen industry, most likely for someone else if his firm didn’t quite succeed on its own. What we do know is that we next encounter him in Camden as part of Esterbrook & Co.
An important part of the often-told Esterbrook origin story involves Richard Sr. bringing several Birmingham pen makers to the US to set up their factory along the current British lines. In none of the accounts are these men named, and their number varies from the vague “few” to five or as many as seven. I believe James Bromsgrove can definitely be counted among these Birmingham men. How can we find the others? One way is to look in directories of Camden at the time of the founding of the factory. We first encounter possible candidates in the directory compiled in 1862. There is an Edmund Smith listed as “penmaker” at 120 Elm Street, and a John Turner, “steel pen manufacturer” at 133 Birch. Edmund Smith remains a mystery despite my many efforts. Directories of the time were not terribly consistent with their entries, so it’s not clear from “penmaker” what kind of pens he made. There is a Thomas Farnham listed in the same directory, but he’s specifically a “gold pen maker.” It could also be that Edmund Smith was really Edward Smith who shows up a few years later as a partner in a new steel pen company in Philadelphia headed by the same John Turner. More investigation is needed. John Turner, on the other hand, is a much clearer case. We know more about John Turner because after Esterbrook he goes on to run two other steel pen companies, including the major steel pen manufacturer, Turner & Harrison. In a 1901 biographical sketch of Turner, it mentions that he came to the US from Britain in 1860 “as one of a small party of skilled pen makers to start the first pen factory in this country.” (Geyer’s Stationer, 4 April 1901, page 12) There is only one factory that fits this description, the Esterbrook factory in Camden, and at the right time we find him living just a couple of blocks from the Esterbrook factory, listed as a “steel pen manufacturer” in a city with only one steel pen factory. It doesn’t take Sherlock Holmes to tie the two together. John Turner was born in Birmingham in 1823, making him ten-years younger than Esterbrook Senior. Turner was apprenticed to Gillott around 1836 to learn the pen trade. Sometime after his apprenticeship as a tool maker, he left for France for a spell to learn how they made pens there. He eventually returned to Birmingham where he married his wife Eliza. He arrives in New York by himself in 1860 on the ship Persia. Some time after this he must have sent for his wife and their adopted daughter Rosina as they are listed in the 1870 Census for Philadelphia. John Turner helped Esterbrook start up the factory and get it running, but in 1865, he was offered the position of president and the responsibilities to start up and run a new steel pen company being founded across the river in Philadelphia called Warrington & Co.
Samuel Warrington was a manufacturer of small metallic mountings in Philadelphia. He created a new design of steel pen and was granted a patent for it in 1866. John Turner’s and Warrington’s stories will be told more fully in a separate article. Despite Turner’s leaving, Esterbrook seems to find a solid footing and early success. In 1862 his pens are being sold far and wide. Here’s an ad from a stationer in Detroit from 26 Nov. 1862 in the Detroit Free Press. His pens are even making it into occupied portions of the Confederacy. Just one year after the successful recapture of Vicksburg, Mississippi by the Union forces, Richard Esterbrook’s New Jersey-made pens are being sold there. By the end of the war, in 1865, we find ads for Esterbrook pens from Kansas to Nashville, Mississippi to Vermont. In 1866, Richard Sr. decides to dissolve the original partnership, buy out the old partners, and form a new corporation with just himself and Richard Esterbrook Junior as partners. 1866 is also when Richard Esterbrook Sr. finally sells his home and stationery shop in Liskeard. He had maintained ties back to Liskeard while starting up his business in Camden. He even voted in the local Cornwall elections of 1861 and 1863/64, still listing Dean Terrace as his address. But 1866 seems to be the year he decided to make a clean break and commit to his new country and his growing company. Much can be speculated as to the cause and timing. One reason that may have contributed to this is that just the year before, in 1865, Richard Jr.’s first wife Jeanette had died giving birth to their daughter of the same name. Junior was now left with a young son (named Richard Esterbrook, naturally) and a new-born daughter. He had also moved to Long Island from New Jersey the year before in order to better look after the New York office, and now was in need of family and a support system more than ever. Right about this time is when Esterbrook finally closed the Philadelphia offices for good, and soon after the announced reformation of the company, they moved the business offices full-time to New York City. By the next year (1867) they had moved from their old offices at 42 John St. to 51 John Street. After the dissolution of the original partnership, Joel Cadbury goes on to run a very successful brass plumbing parts supply company in Philadelphia. James Bromsgrove retires back to England where he stays for a while. In the 1871 census, we find he and his wife in London, and he’s listed as a “retired clerk.” According to his obituary, in 1881 he emigrates to New Zealand where he lives out the remainder of his days. He’s buried in Auckland. John Turner goes on to run Warrington & Co. until 1870 when he and another Birmingham pen maker, also brought over to start up another pen company, George Harrison (see the articles on WashingtonMedallion Pen Company), form Turner & Harrison, which continues to produce steel pens until its dissolution in 1952, but that’s another story. Since writing my original post on Peregrine Williamson, I’ve found some additional interesting information, including a treasure trove of his letters with President Thomas Jefferson! I have some interesting tidbits I’ll cover first, but the most interesting of my new discoveries are the letters. There are some really interesting bits in them. I had covered the fact that Peregrine was an inventor beyond pens. I found a good list of all known patents filed by Williamson on the venerable source for all patent informatin related to hardware and tools: the Directory of American Tool and Machinery Patents DATAMP. Unfortunately, all but the last of these patents are what are called “x” patents, which most of the time have no real information since most patents prior to 1836 were destroyed in a fire. This last patent is actually quite interesting. It’s a re-issue of the one from 1829. The significance of this patent is not just that there’s a diagram connected to an X patent, but that Williamson was patenting a cooking stove to be used in a railroad car right on the threshold of the first steam-powered railroad to be run in the US (1830). Another example of Peregrine Williamson being on the bleeding edge of a new technical revolution. In 1822, the Baltimore city council passed a resolution to allow Peregrine Williamson to sweep some chimneys in Baltimore using his new invention. Permission granted to Peregrine Williamson to sweep a certain number of chimneys in the City by his newly invented machine. Be it resolved by the Mayor and City Council of Baltimore, That whenever Peregrine Williamson shall produce to the Mayor the assent of any twenty inhabitants of this city, who are housekeepers, that they are willing and desirous to make use of the said Peregrine Williamson’s invention for sweeping chimnies [sic], that it shall be lawful for them to have the said machine erected in their chimnies, without being liable to have their chimnies swept in the usual way, or being subject to any fine for the neglect of having it done; provided, that this permission shall not extend beyond twelve months from the passage of this resolution; and provided also, that nothing in this resolution shall be construed to exempt said persons from the operations of the ordinances now in force, if said person or persons shall neglect to sweep with said machine as often as may be required by law. In my original post I mentioned Williamson’s 1808 advertisement which included an endorsement from President Thomas Jefferson. I recently ran across several pieces of the correspondence between Williamson and Jefferson in the collection of the Jefferson Papers of the National Archives. Their correspondence yields up some interesting facts and conclusions. I will look at each letter and follow up with a commentary pointing out significant things about the letter. N.B. these National Archive letters are still considered “Early Access” versions, i.e. they haven’t been fully vetted and published. Also, you’ll notice right away that spelling and capitalization seemed more of a competitive sport back then than a set of rules. do me the pleasure to Except of two of my three Slit metalic pens in a Calander case which I have Sent you as a preasent and pledge of Respect, I have Contemplated Sending you one before but have been prevented from Considerations of its imperfection to which inventions generally are liable, but haveing been making them for nearly two years they have been considerably improved—So it is with some degree of boldness and asureance I have Sent you those for your inspection and approbation and Especily as many of the most Eminent and Celebrated penmen of this and other places, have pronounced them to be far Superior to any of the patent metalic pens that have ever been invented heretorfore either in Europe or America it being well known that all the metalic pens upon the former principle have been wanting in that flexibility and Elasticity which is So necesary in order to write with Smoothness and Rapidity which in this is happily effected by the two aditional Side Slits—there is no doubt but that you will at once percieve the intention of the principle—that it is to relieve it of that otherwise inevitable Stiffness to which it has always been fixt. you will also discover the utility if not the necesity of the Substance on the nib the pen being reduced to give it the necesary Elasticity and Spring is made too thin without that Substance which is to prevent its acting Severe upon the paper—I merely make those Remarks on the pen to answer the probable inquaries that might arise from the investigations of a Curious mind—You will receive the case with the two Steel pens and pencil both pens fiting in the Same place with directions for pen and Calander wrapt round the case and all inclosd with in a case—Directions to open the Silver case. first to get at the pens pull the plane part from the Calander and it opens in the centre then turning the end of that part directly into the place out of which the pen was taken in order to lengthen it Suficiently to write with—then if the pencil is wanted returne the pen into its place you will notice a Small Sckrew in the centre which in one position Serves to pull out the pen and when turned to the left it opens to the pencil—Sir Should fancy suggest any new idea for the improvement of the pen (as perhaps there is yet room) it will be chearefully Received and adopted. The reference to a calendar indicates that Williamson had included one of the perpetual calendars which were popular on fancy pencils and such in the 18th-century. This also indicates that Williamson is positioning his pen in the longer tradition of luxury writing implements. One key things we find out is that Williamson had been making his pens for almost two years at this point, so he had begun making pens in 1806. Which raises the question, so there were other patent metallic pens invented in America before this?? I know Wise is England was making patented pens, but I’ve not heard of any others in the US, at least as a commercial enterprise. There is evidence that individual pens were made by inventors and craftsmen, but so far there’s no evidence of a commercial production of metallic pens in the US before Williamson. The descriptions sounds a lot like a sliding pen/pencil configuration. I’d be curious when the first slide pencil was produced. Sir I am very much gratifyed that the pen I had the pleasure of Sending you Suited and pleasd and that my feeble improvements had in any degree entitled me to the high Reward of your approbation—you have Sent an order for half a dozen of my pens which I have particularly Selected as you want to accommodate them to one of Peale’s polygraphs if those pens Should not be Sufficiently pliable a line addressd to me at No 72. Market Street, Baltimore I will Remidy the defect. Peale’s polygraph is a device for writing multiple copies simultaneously by connecting the writer’s pen to multiple other pens which all write at the same time. The original was invented by John Isaac Hawkins, and when Hawkins left America for England, he turned over his patent to Charles Wilson Peale, the famous American portrait painter. Peale, working with Jefferson, continued to make improvements on the device, and Jefferson continued to buy new versions. the use of the polygraph has spoiled me for the old copying press the copies of which are hardly ever legible . . . . I could not, now therefore, live without the Polygraph. The polygraph currently at Monticello is fitted up with quill pen points, like the ones invented by Joseph Bramah in 1809. These are similar to today’s dip pens, but made out of feather quills. This brings us to the interesting question of what form these pens took. Other accounts say that Williamson was making barrel pens, i.e. pens which were attached to a tube of metal that was mounted on a holder of wood, pearl, etc… But to mount them on the polygraph, they would have had to be at least unmounted. The polygraph currently in Monticello was from 1806, so could be the one he experimented with these new steel pens. Jefferson owned at least 11, so it’s not clear which one he would have used, but it must have been able to affix a steel barrel pen to the end. And if he had previously been using full quills (pre-Bramah), then putting a barrel pen would not have been much different than the quill. What’s also interesting is that this was not the first time Jefferson had had a steel pen recommended for his polygraph. Upon first receiving the polygraph, he writes this to Peale in 19 Aug. 1804. So, this means that Jefferson had tried a steel pen before, didn’t like it and preferred quills until he tried Williamson’s pens in 1808. And the last very interesting bit of information is that Peregrine Williamson was located at 72 Market St. in Baltimore. I’m trying to find where this would have been at the time. What I have been able to figure out is that what was Market St. in Baltimore town is today’s Baltimore St..
Jefferson liked the original pen combos so much he wanted to give some as presents. The half dozen metallic pens you sent me according to request, came safe to hand, & have answered their purpose well. I have now to ask the favor of you to send me 4. such as the one you were so kind as to send me first, that is to say a pen & pencil combined in a silver stem with a Calendar to it, & each in a separate wooden case. they are intended as presents to friends. the cost of these added to the preceding, shall be immediately remitted if you will be so good as to accompany them with a note of the amount. Accept my salutations. We learn that the pen/pencil combo was mounted in silver and came in a wooden box. And again with the “Calendar” which is not clear. The other message is clear, just send me these, and I’ll finally get around to paying you for these and the six pens you just sent me. So, he gets an order from the President for four of his fanciest pens each with their own wooden box. You can only imagine the scramble. But it must not have been too terrible. It seems as if he already had the pens made, or close to, as it only took two weeks from Jefferson sending the order, and Williamson filling it. In this letter, Peregrine asks the President if he can publish the kind words that Jefferson had written to Williamson. These must be the words in the advertisement. Th: Jefferson presents his compliments to P. Williamson, and his thanks for the very fine steel Pen he has been so kind as to send him. It is certainly superior to any metallic pen he has ever seen, and will save a great deal of trouble and time employed in mending the quill pen. The advertisements also include a quote from the next letter we have, but this is from a letter that is missing from the sequence. Sir Washington Mar. 22. 08. I have been so much engaged lately that it has not been in my power sooner to write this short letter. The 4. calendar pens arrived safely, and I now inclose you a bank draught for 25. D. for those & what was furnished before. I find them answer perfectly and now indeed use no other kind. always willing to render service to any useful advance in the arts, I have no objection to your using the little testimony in their favor which I expressed on a former occasion, as desired in yours of the 7th. inst. I tender you my salutations. Jefferson has been using the steel pens for almost six months now and has gotten the measure of them. This is usually when the honeymoon period with any new technology is well and behind you. I must trouble you for a new supply of your steel pen points. I find them excellent while they last, and an entire relief from the trouble of mending. but, altho’ I clean them carefully when laid by for the day, yet the constant use for 6. or 7. hours every day, very soon begins to injure them. the points begin to be corroded, & become ragged, & the slit rusts itself open. I have sometimes, but rarely succeeded in smoothing the point on a hone, and the opening of the slit is quite irremediable. I inclose three which will shew the manner of their going. I will thank you for half a dozen or a dozen points of the same caliber, & a note of their amount which I will have remitted. I tender you my salutations. The President is discovering that 6 to 7 hours a day, probably every day, spent sitting in the highly corrosive iron gall ink of the day, would play havoc upon a steel pen. This is a problem pen makers try and fix for the next 130 years with many and wondrous solutions. It’s not until stainless steel nibs are introduced in the 20th century is this no longer such a problem. Peregrine Williamson writes back with some advice and an interesting observation. We do find steel pen repair services in London at an early date, but this is the first reference in the US. But the most interesting morsel from this letter is the proof that Williamson experimented with gold and silver pens before settling on steel. He found that silver and gold wore away too easily. This was known as well by others, and was the cause of the search for a harder tipping that could go on the end of the gold pen. Williamson’s point, that yes, steel pens may rust and get sharp, at least they don’t wear down so quickly as more expensive metals like silver and gold. And now he’s offering to meet Jefferson in person and show him how to hone is pens. Too bad we don’t know if he ever made it. The final letter I’ve been able to find in Jefferson’s letters in the National Archives is from almost 10 months after the first. I avail myself of the peculiar pleasure and satisfaction of sending You the half doz steel Pens Which I hope (last promised) will be in due time. it’s clear that Jefferson continues to order pens from Williamson. In a letter of 1 Dec. 1808, he receives the account (assuming showing paid) from P. Williamson with a balance of four dollars from teh 10 dollars his grandson left with the writer, John Rigden, the watchmaker mentioned in the previous letter. Seems Mr. Randolph just dumped the $10 with the watchmaker and never made it to Williamson. Ridgen must have paid Williamson and sent the money back to Jefferson. In a letter of 22 Nov 1814, from William Caruthers, he mentions that based on Jefferson’s recommendation, Caruthers stopped by P. Williamson’s in Baltimore to see his newly patented method for making small shot. (see his patent from 1813). While Caruthers is not terribly confident of either Williamson or the other gentleman he visited being ultimately successful, he did think more highly of Williamson’s method. This indicates that Jefferson is keeping track of Williamson and his inventions. I thank you, Dear Sir, for the elegant pens you have been so kind as to send me; they perform their office admirably. I had formerly got such from Baltimore, but they were of steel, and their points rusted off immediately. One can only assume they were gold pens, now being made in New York City with tipping to make them much more durable. 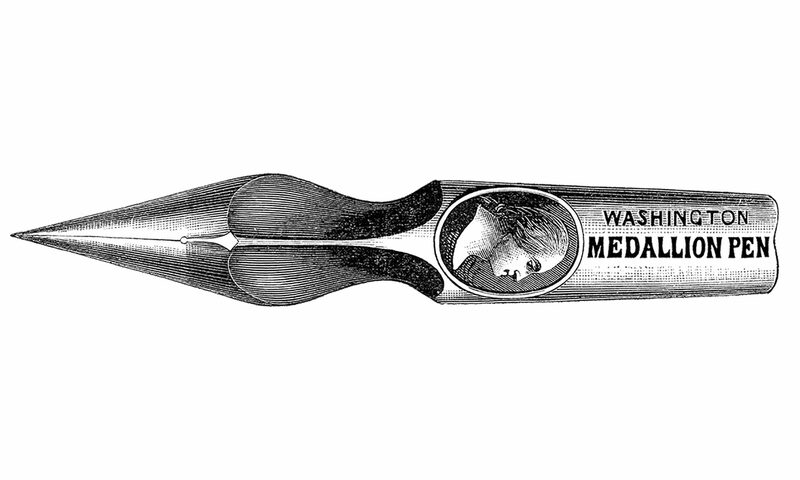 In my post on how pens were made in 1857 (and 1890), I list the main processes used by the Washington Medallion Pen Co. in 1857, and the general process used by British manufacturers in 1890. I pointed out in that post that the similarities between Washington Medallion in New York City, and the process described by Henry Bore in Birmingham 33 years later, were almost certainly due to the fact that the American factory was set up by British-trained pen tool makers. I also mentioned that another famous pen maker of the time also had their factory set up by British-trained pen tool makers: Esterbrook. Esterbrook opened their Camden, NJ factory in 1858, a year after the Washington Medallion article came out. I’ve not been able to find any detailed records of those early years, but I did run across an amazing image of the factory from 1885 made by Sanborn and used by insurance companies. All of these steps can be seen in the map. In building A, for example, on the first floor is scouring, second floor is cutting, third is raising and fourth is piercing. You also find rolling and hardening furnaces in the back, varnishing over along the east wall, and examining, weighing and box making in the front. (Esterbrook made their own boxes at this point). Another example of how these same basic steps carried over into the 20th-century, we find a sample card used by salesmen to shows the various steps used in making a pen. The sample card probably dates from the 19-teens or maybe 20’s. The captions for the pens are above the objects.